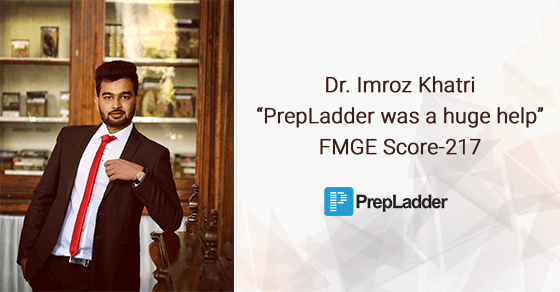 Prepladder congratulates Dr. Imroz Khatri on clearing FMGE June 2018 exam. We wish him all the very best for his career and future ahead. I am Dr. Imroz Khatri from Gujarat. I graduated from Odessa National Medical University in 2017. Dr. Deepak Marwah’s Pre-FMGE exam conducted by PrepLadder was an eye-opener. I just scored 127 marks and thereafter I worked on my weak areas, focused on revision and improved my score to 217 marks in FMGE June 2018. I think both theory and MCQs are important for appearing for this exam. The preparation should begin 4-5 months before exam. I studied notes along with books - FMGE Solutions, Kamal kv and Microbiology by Apurva Shankar Shastri. It was my second attempt. I made sure not to repeat the mistakes I did earlier. What's the role of practice and revision while preparing for FMGE and how much time should be dedicated for it ? Revision is the key for success and practice helps to boost the confidence. Did PrepLadder play a part in your success ?If yes, how ? Prepladder was a huge help. I practiced everyday for 2 hours after revising my notes. It helped me to keep my preparation on track. Did you follow a time table/study plan to keep your preparation on track? My daily routine helped me memorize things which seemed impossible. Were you a topper or an average student during graduation ? Biochemistry was very difficult to remember. The easiest one for me was ENT and Opthalmology. One mistake that should be avoided while preparing for FMGE? Worst are the silly mistakes which one does when the question and options are not read properly. Follow one fixed schedule which includes revising your notes daily and practicing mcqs after that. Give maximum revision to your handwritten notes from PrepLadder video lectures and attempt mcqs after that and access yourself. Remember REVISION IS THE ONLY KEY FOR SUCCESS!! We thank Dr. Dr. Imroz Khatri for sharing his success story.